I do a free initial consultation to evaluate the job and once I am hired for your project I charge an $125 an hour design fee. A beautiful life begins at home. At Neela Woodard Design we create beautiful and custom interiors that turn your house into the home you have always dreamed of. We take the time to learn how you live your life and what you wish your home could be. Each project is a collaborative and personalized experience that ensures your finished home reflects exactly who you are. All aspects of the design processes are meticulously thought out and pieces are selected that are not only beautiful, but well-made and livable. Space and scale are carefully considered as is color, pattern and form. We understand that the finishing touches are what pull a home together so we make sure that each project is done to completion. 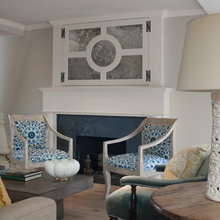 At Neela Woodard Design we know that the things you love are what make your home special. Our clients appreciate our ability to understand their lifestyle, taste and preferences. Together we create a unique and appealing environment while being attuned to our client’s time and budget. We believe that everyone deserves a beautiful, livable and well-designed home. Neela Woodard founded Neela Woodard Design ten years ago after working for a number of established New York City design firms including Michael Foster Designs, Pappas Miron Design and ToCar Inc. She earned her degree in interior design at the esteemed and FIDER accredited New York School of Interior Design where she graduated with highest honors. 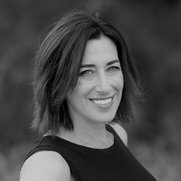 She is currently an allied member of the American Society of Interior Design (ASID) and has been awarded Best of Houzz for the past three years in a row. We had a damaging flood... After much construction, we needed a decorator. I can’t say enough about how wonderful Neela has been. She has been there for every step of the way. 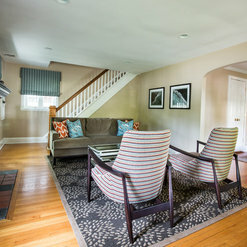 We renovated our living room, dining room, master bedroom and master bath. 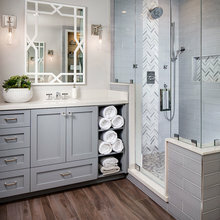 We selected paint colors, drapes, all sorts of tile and bathroom fixtures. Neela was very helpful in making decisions based upon our input and taste and respectfully disagreed and guided us when necessary. She measured and measured and measured! Everything is now in place for the holidays!! Our home looks FABULOUS! We presented Neela with the challenging task of combining the separate styles and households of a newly remarried ‘mature’ couple. Combining our mix of eclectic, modern, and traditional furniture and placing them into a modern style townhouse was handled sensitively, sensibly, and creatively. Neela immediately had placement ideas for the furniture, rugs, and accessories we already had, mixing and blending everything in a way that was ingenious. 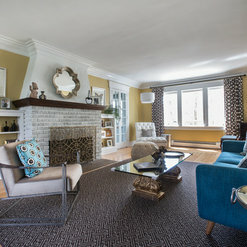 Then we moved on to bringing in some new lighting, fabrics, window treatments, furniture, and accessories to give our entire home a custom look and a feel that everything was chosen by just the two of us for our own home over the years. Neela brought her young, fresh, and clean design flair to our home and yet was able to work out a blend of traditional and modern design that has made our home feel just right for us. We couldn’t be more pleased with the results and with Neela! I hired Neela to help me with a sizable remodel, including kitchen (knocking down a wall for an open floor plan), master bathroom, secondary bathroom, and design/decorate master bedroom, living room, dining room, den and guest bedroom. Her design plans for the kitchen were brilliant. Neela initially spent time determining the style and colors I like and kept these in mind as we selected materials, furniture and colors. 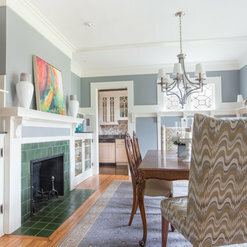 We accomplished the look and quality I was hoping for: I feel like my house “fits me.” I was always given options for quality and price – remaining mindful of my budget. Neela coordinated with the contractor and subs to ensure the work conformed to the plans. She was present or available to answer questions at critical times during construction. I love my house and I couldn’t have done it without Neela! I was a recently divorced father with children and needed someone who could help me set up a home. Neela was great. She understood what I liked in design, color and comfort. I like design that is clean and uncluttered; warm and inviting; and within my budget . 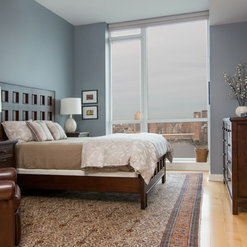 Neela was able to find just the right furniture, window treatments and accessories for all seven room. She selected colors for the walls that were comforting. The house I moved into was built in the 1920's and several rooms needed renovation. 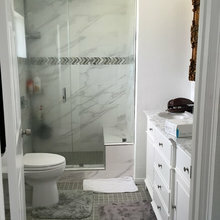 Neela was able to design changes that made the kitchen, bathrooms and family room feel different and be much more usable without my having to undergo a major renovation. It was great working with her. We purchased a brand new house with almost no existing furniture as we had moved from a 1 bedroom apartment. Neela furnished and designed our entire house. 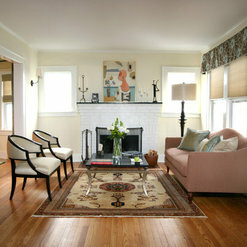 She helped us with everything from choosing the furniture and rugs to curtains and light fixtures. Neela was totally on point with our taste and transformed it into new concepts that were very modern and tasteful. She gave us lots of options and kept everything within our budget. Neela is great with color and texture and is great at making sure that all of the rooms are different and unique, but flow together nicely. She is so easy, honest, and fun to work with! I highly recommend her to anyone looking. 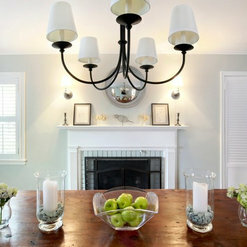 I hired Neela Woodard to design my living, dining, and family rooms. When I started interviewing interior designers for my project, I wanted someone who was very detailed oriented; accommodating with my busy schedule; and who would guide my decisions without being overbearing. Neela met all expectations. I am very pleased with the end result and would not hesitate recommending Neela to anyone. I've been working with Neela for over a year now, on a living room/entry/dining room re-design (and various other small projects around the house). During that time, she's helped me and my husband transform our dated home into a sleek and polished, yet comfortable and family friendly, space to live. She's somehow managed to translate my unconventional design "inspiration" requests into reality, which is by far her greatest accomplishment. Seeing individual pieces fit together so beautifully and comprehensively has been so exciting. And she's also been very patient with us despite some timing delays due to the birth of our first child mid-project and our busy work schedule! Highly recommend. Great experience! Neela is very talented. 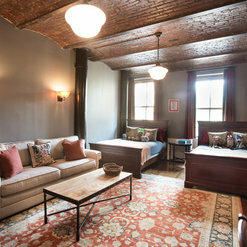 Neela designed several rooms in my home to create a classic look with modern touches. From paint colors to accessories, she can do it all. She's respectful, timely, professional, and organized. I worked with Neela from 2012-2014 on furnishing my entire home. We had recently move to a home from an apartment so we came with very little pre-existing furniture. Neela was great to work as she really took the time to understand and frankly help me understand my design style. She never pushed me or tried to sell me which i appreciated. Her end goal was truly to make my house a "home" and something I Loved coming home to. I have to say she achieved that goal. I absolutely love me house. It is exactly my style but does not appear to be "overly designed" when you walk in. I can't tell you the number of compliments i get on my house and my design style :) I could never have done this on my own or achieved this result. While decorating my home was a process, the end result was well worth it! Neela was great to work with and did work hard to ensure that i was happy! I work in the design community and from the beginning of my collaboration with Neela I found her to be absolutely professional, focused, clear and communicative regarding every facet of the commission process. Working together was inspiring and a greatly creative experience for me. She has a wonderful eye for color and can be flexible and open to expanding on new ideas. I look forward to us working together again soon. Working with Neela was a great experience. I always knew my home had potential, but I wasn’t close to finding it. Neela transformed my living space. It couldn’t be any more beautiful. Neela helped my husband and I move beyond our initial comfort zone while being mindful of our needs and desires. Under her guidance, we chose the perfect layout and furnishings to suit our lifestyle. Moreover, it was a joy to work with Neela. She was always reliable and prepared for our meetings. Neela’s down-to-earth, friendly manner made what might have been a stressful process a pleasurable one. Neela completely designed a new apartment that I was moving into. The results are exquisite, and it was a delight to work with her. Neela has a superb sense of style and, at the same time, she readily fine tunes her recommendations to the needs and sensibilities of the client. I had fairly specific notions of what I wanted, but with every element, she improved, refined or replaced to create a far better outcome and a cohesiveness that I hadn't considered. Each item of furniture or fixture she recommended was of higher quality than what I had initially selected, usually at the same or lower cost. She wasn't rigid, always providing several choices (or cheerfully going through a couple of cycles of choices for me); and on the few occasions in which I wished to include an odd piece, she worked with alacrity to incorporate it flawlessly. The best assessment I can provide is that I have now lived in the space for well over 2 years and I wouldn't change a thing. 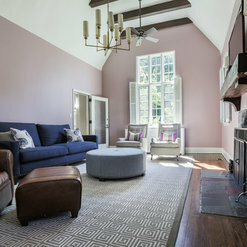 Commented: Who makes this rug?It’s a carpet by Nourison that I had custom sized and cut down into an area rug. Commented: Should the range be centred with the island?I agree actually with meggielh. I think that is what was bugging me about the stove workspace room too. If those are uppers I think it would be better. 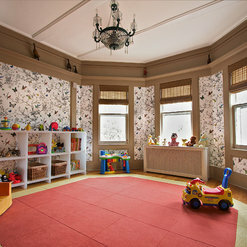 Commented: Love the rug, where is it from?Hi, the rug is from Suyra. I believe it is still current. Commented: CarpetHi, it is a custom designed carpet we had made especially for the client. I am so glad you liked it. 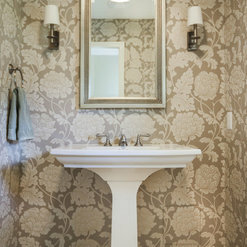 Commented: WallpaperHi, the wallpaper is Harlequin 110291 Lucerne Folia.